The Pilot EX-L is our recommended trim for a number of reasons, the most important factors being that it keeps the six-speed automatic transmission while allowing high levels of specification. It’s also the first model to equip leather upholstery, doing so with heated front seats, a leather-clad steering wheel, and power front passenger seat adjustment. The power sunroof is a classy touch, while a power tailgate increases the convenience-factor. 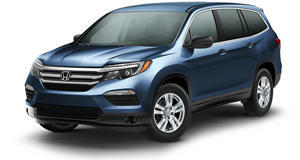 What seals the deal is the availability of not just Honda Sensing, but the options of equipping navigation and a rear seat entertainment system too. For a mid-range price, you get a whole lot of car.